Vote NO on this mill levy. 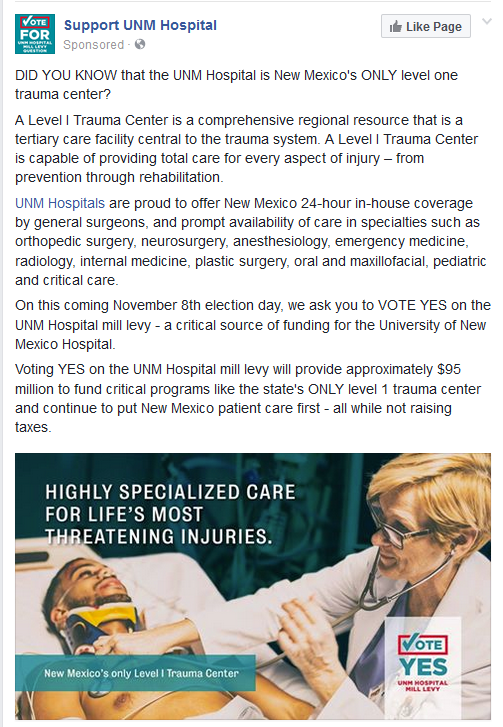 Tell UNM to get that ∅95 million from the legislators’ pensions, the film subsidies, the Local Economic Devlopment Authority, oil and gas subsidies, NMHIX, the Obamacare Medicaid expansion, among other places. The politicians love to load up the bond issues and mill levies with the popular stuff – buildings, infrastructure and “services” that “must” done by government, because “no one in the private sector can or will do them” – police, libraries, senior centers, community centers, sewers, storm drains, flood control, and so forth. We all know that’s hogwash, to put it delicately. Once the politicians load up the bonds and levies with the popular stuff, that frees them to use more from the general budget for their pet projects, their legalized vote-buying schemes (each City Councilor in Albuquerque is allocated ∅1-2 million annually for “needed improvements in their district), making sure that someone in the inside loop gets the contract for the next “necessary” project. And when was the last time that taxes in Bernalillo County actually went down? Between the City of Albuquerque and Bernalillo County, we’re paying some of the highest gross receipt taxes in the state – currently at 7.3125 percent. Now they expect us to pay even more?! Tell the politicians that for every new tax they want to impose upon us, at the very least, get rid of an equivalent tax, so that the overall burden doesn’t increase.